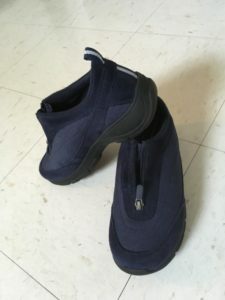 Until now, my only everyday shoes were boots that are too big and are meant to be worn with thick socks and custom orthotic sandals. I’d stay in my boots until I could wear my sandals. Not only are athletic shoes not stylish terrifically stylish, but the mesh top will let the rain and wind in. I wear dress shoes when necessary, but I take them off under the table. See, my feet don’t fit into shoes. They’re kind of wedge-shaped, the widest part being the toes. They do not taper, they are just straight across. My sister’s feet are the same way. A gift from our mother, who wore tennis shoes (generic ones, that’s all they had then) most of the time when she didn’t need dress shoes. My sister got her feet used to shoes because she moved to ski country. I never did. Which is what makes this pair of shoes so amazing! They were on sale at LL Bean’s. It’s the color that sold me on trying them. I like navy. It’s neutral, but with a bit of zing to it. And they offered wide. Not wide enough for me, I thought, but I bought them anyway. A half-size too big (that’s a given). And OMG! They work! It took me a week or so to get used to them (that’s normal, right?) and I still can’t wear any shoe all day. But I can wear it for hours at a time. I know this sounds like I’m over-reacting, but I’m really not. This is something everybody else just takes for granted, like getting new shoes for back-to-school every fall when you were a kid. But I’ve never had a pair of just ordinary shoes. Not since I was a kid. I really like things that make me feel a little more normal.